Description: This Book Integrates Legal, Economic, And Administrative Materials About The Value Added Tax (Vat) To Present The Only Comparative Approach To The Study Of Vat Law. 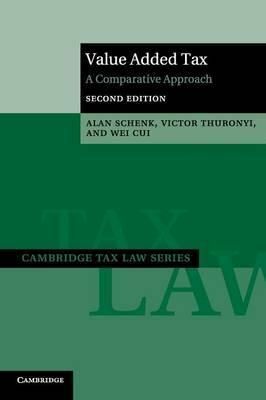 The Comparative Presentation Of This Volume Offers An Analysis Of Policy Issues Relating To Tax Structure And Tax Base As Well As Insights Into How Cases Arising Out Of Vat Disputes Have Been Resolved. Its Principal Purpose Is To Provide Comprehensive Teaching Tools - Laws, Cases, Analytical Exercises, And Questions Drawn From The Experience Of Countries And Organizations Around The World. This Second Edition Includes New Vat-Related Developments In Europe, Asia, Africa, And Australia And Adds New Chapters On Vat Avoidance And Evasion And On China'S Vat. Designed To Illustrate, Analyze, And Explain The Principal Theoretical And Operating Features Of Value Added Taxes, Including Their Adoption And Implementation, This Book Will Be An Invaluable Resource For Tax Practitioners And Government Officials.